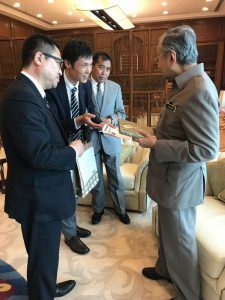 On 28th November 2018, Mr. Takeshi Okada, Senior Executive Director of TAKEX Corporation, Mr. Kosei Sugawara, a director of TAKEX Corporation, and Ms. Ruhil Amani, a director of TAKEXCO Malaysia paid a courtesy visit to Malaysian Prime Minister Tun Dr. Mahathir bin Mohamad. This visit was achieved by Mr. Nakano, Executive Vice President of OISCA International, Datuk Ibrahim, Vice President of OISCA International, and Mr. Nagaishi, Secretary General of OISCA International as a part of the report of initiative that is collaborating with MARA, Malaysian government agency, over the years. Takex was introduced as a positive result of the MARA-OISCA International Business Forum, and we had a valuable opportunity to explain our business development in Malaysia. We introduced “Takex Clean”, the food-grade ethanol sanitizer certified as halal product by JAKIM. Also, we informed Prime Minister Tun Dr. Mahathir Mohamad our approach to strengthen hygiene environment around the world by developing this product which is manufactured in Malaysia as a product of “Made in Malaysia” to the global halal market. Prime Minister Tun Dr. Mahathir Mohamad is known to promote “Look East Policy” which emulates the successful model of economic growth in Japan. Furthermore, he has already visited Japan three times since he was sworn in again as Prime Minister this year. At the Japan – Malaysia summit meeting, it became a topic that Malaysian Prime Minister Tun Dr. Mahathir Mohamad and Japanese Prime Minister Shinzo Abe came to an agreement that Malaysia strengthens “Look East Policy” and Malaysia and Japan deepen their bilateral relationship. We will continue to make every effort to contribute that movement.